Only recently have i realized that i don’t stand up for myself all that well. If I’d thought about it, I would have noticed. I just never thought about it. But now that i get it, i’m determined to change it. This little revelation has unfortunately coincided with Caden-3yr deciding that I really don’t measure up to the other moms at PeeTool. (PeeTool is how he says ‘preschool.’) PeeTool is exceptionally important to Caden-3yr, who has only just started going this fall, and only three mornings a week. Those three mornings a week have given him peers and peers’ mommies with whom he can now make comparisons. How truly helpful. “…huh?” I wore black Adidas capris and a black t shirt, hair back in a little elastic headband thing. “yes.” I thought that was the end of it. We arrive, and I take Caden-3yr to his classroom, balancing Seth-2yr on my left hip. I sign him in, amid a small crowd of one mom and two dads saying goodbye to their own little ones. Caden-3yr decides a public apology is in order. Oh. YES. And a loud one, since he is three, and everything is loud. “MY MOM IS JUST DROPPING ME OFF HERE AND THEN SHE IS GOING TO THE GYM TO WORKOUT. THAT IS WHY SHE LOOKS LIKE THAT. BUT IT IS OKAY. SHE SAID SHE WILL TAKE A SHOWER AND CHANGE CLOTHES AFTER SHE’S DONE.” So with that taken care of, he walks off into his classroom, and i avoid the possiblity of making eye contact with other parents by kissing Seth-2yr’s cheek as I leave. Very, very humbling. When I pick Caden-3yr up, he waits until we are out of the building before nodding at me and saying, “You look VERY nice, Mom. You look… CLEAN.” I didn’t say anything – yet – but getting a Hygiene Talk from a kid who has been potty trained less than six months is really obnoxious. “Because I DO THAT sometimes! And you know what? It’s okay!” It’s a big giant Escalade. OF COURSE i occasionally park a corner of it on a curb or a sidewalk. Caden-3yr shook his head and said that his friends’ moms do not put their tires on the sidewalk. To be sure, he looked at all the other cars neatly in their spaces. This attitude is new. And I’m thinking it has to go. So we get in the car and he tells me that if I park on the sidewalk, I should just back up and try again. Now. That might strike some of you as sweet. And accurate. Good advice, even. But after the morning I’d already had, it didn’t go over well. 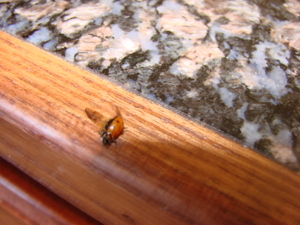 I turned around in my seat to look at him, seated directly behind me. Our heads might have been at odd angles since one side of the car was a little jacked up on the sidewalk. whatever. He looked confused. Apparently I was the only one who really loved the musical selections on the way to preschool today. I realized he had no idea what I was talking about. It didn’t matter. i needed to say it. We rode in silence almost all the way home before he spoke again. Then he said something I have said to him many times. Caden-3yr is a blond, blue eyed, sunny sort of kid. He likes to laugh, and he’s good at sharing. This week he started swearing like a cranky little sailor lost at sea. I was horrified. Have I told y’all that Seth-2yr is saying everything he hears Caden-3yr say? I could see where this was headed. “Um. Uh huh. I thought you did.” I was going to leave it at that while I figured out what to do next. As if I had forgotten. “And that’s the problem, Caden-3yr” I tried to calmly explain. I stomped back inside. Caden-3yr and I had a long complicated conversation and finally figured out which of his friends says this at PeeTool. It helped once he told me “IT’S A LITTLE GIRL, MOM.” Right. After a few more uses of his new favorite word, my fake calm was gone. I’m surprised it lasted as long as it did. I threw the traditional ‘ignore it and don’t react’ wisdom out the window and told him if he continued to use that word, my hand would spank his backside each and every time. Three hours later we’re at the restaurant in Tucumcari with the big cow on the sign. It’s on our way to Albuquerque, and the onion rings are great there, if you’re ever passing through. Not that I had onion rings, or that they would be relevant. They’re not. But Caden-3yr spilled his drink, and that IS relevant, because he just shook his head and uttered “^$#%$#! !” The waitress looked at me, saw that I had clearly abandoned the Do Not React train of thought somewhere east of Tucumcari, and she got out of my way. Nice threat. Really, really nice. I’m impressed, but unmoved. We got to the bathroom and I told him I was willing to take that chance. I spanked. We talked. When we got back to the table, Mike was back there – having been changing Seth-2yr in the men’s room while all this happened. And we remembered that last week Caden-3yr used to say “Oh, MAN!” like Swiper the Fox on Dora the Explorer. He also is fond of ‘Oh! My! Goodness!’ So we talked about those phrases. No swearing since. One spanking and a brainstorming session later, and his vocabularly is back to its normal, less than colorful status. Bad habit seemingly kicked, BEFORE it could be passed on to other brothers. That’s a victory all on its own. I am SO impressed with my cousin. She just ran her first marathon. i know! just the WORD marathon makes me tired! But she did, and did it well, and finished under her goal time and I’m just so proud. Congratulations, Stephanie, our October Club 17 winner! I went out of town for a few days, and have just returned to a flurry of sweet little boy kisses. So perfect. You know when little boys play really hard and then they smell like sweaty little puppies? (remember, I have a daughter – she never smelled like this. I’m totally qualified to say it’s the boys with the doggie smell) That particular smell always amuses and surprises me, but tonight! Tonight! They smelled like clean little boys. No sweaty puppy smell. Nice surprise. So. I went to the Grand Canyon for a very spontaneous few days away kind of thing. Alone. Nice. I’d never been there before. It’s supposed to be one of those breathtaking places that just physically demonstrates All Things God, huh? I’m not a visual person at all. I can’t picture anything in my head easily. I need words. I need experiences. Not a great big visual of a canyon. And guess Who made me that way? Yuh huh. SO SEE IT’S FINE and I am not awful. So I took a helicopter ride over the canyon. I was easily distracted by the other passengers and the pilot, who sat directly to my left and kept speaking in French to me because he thought i was the French passenger. (My Texas drawl sounds sooo French with all those helicopter noises going on.) I only understood "Je m’appelle Brian." But anyway. Back to that canyon. Not as interesting to me as the people, as the experience, as the well intentioned French. Then! Ha HA! I managed to talk my way onto an Advanced Level, 3 HOUR, ATV thing-y. ADVANCED All Terrain Vehicle Thing-y. That is code for "Steep, rough, rocky, and wild." I arrived and had to confess immediately that no, I’d never ridden an ATV. Jim and Craig were not really thrilled with that confession. They warned and maybe tried to scare me out of it just a little. I LIKE STEEP! SOUNDS FUN! You’ll be expected to keep up. YES! OF COURSE! I made a few references to my penchant for offroading and rough and mud and I don’t think they believed a word of it. It didn’t help that I struck them as ‘small’, and apparently that is not the best match for an ATV. Jim left me with Craig to get a quick course in ATV-ing while he went to pick up the other four people who would be joining us. The other four people who really were ADVANCED and knew what they were doing. It was rough. It was steep. I kept up just fine for three hours and did not fall off, and it was SO much fun. The other people who went were fantastic, particularly a wildly funny woman named Theresa. I’m so thankful that Jim and Craig let me go with them – they really didn’t have to. Most surprising about those three hours was the amount of dirt that managed to cling to me. I couldn’t have been filthier no matter what else I did for three hours. I was wearing sunglasses WITH goggles on top of those and I managed to have at least a tablespoon of dirt in and around my eyes. What Jim and Craig did NOT say, which I kinda wish they had, but I"m giving them a break since they are men and all, but really. Tell the newbie to WIPE OFF THE PRETTY LIP GLOSS next time. In those three hours that lip gloss acted as Superglue For All Dirt. Remember those few years in the early nineties when everyone was wearing matte brown lipstick? That’s what it looked like, but worse. Ick. I got back to the hotel and took a bath and was HORRIFIED when the water turned opaque brown. I’ve had to drain dirty water and start over again when bathing my dirty little sons, but never for me. I was so sore I canceled my mule riding through the canyon ideas. I tried to sit and stare at the canyon. And instead I found myself trying to guess if people were international tourists based solely on their shoes. And then I shook myself out of that, refocused on the canyon, and then realized I was just staring at the clouds above and listening to the conversations of passersby. Oops. One more try. I don’t have some sort of attention disorder. I’m just not visual. I can do this! And then some sweet girl just like me came and sat down next to me and said, "OHMYGOSH! I JUST LOVE YOUR SHOES!" And I decided she was an angel sent from God with the message of "Give it up. Quit trying so hard to be something you’re not and just look at all the shoes if you want. It’s OKAY." So we did. She was really good at it. In other news, this website (and lots of outdated stuff over to the left) is about to get a makeover, and a sister site – www.kelseykilgore.com will be added. Leanne of eWebscapes is doing them both, and they look great. the whole book thing is moving forward faster than it has been in recent months. I’ll keep you posted, but it should be out soon. Did you know that October is breast cancer awareness month? Really, it seems as if every month is lately. The other night I noticed Ann Taylor has a pink ribbon on their window, and it seems you can ‘shop pink’ just about everywhere. The last time I was in Target (no not that time), they had pink frying pans for sale. I think some of the profit went to breast cancer research. I like pink. Not on a pan. Not that I really like pans of any color, actually. Which brings me to why we have this thing each month. You all meet here, do your monthly self breast exam, then leave a self congratulatory comment, and someone gets a prize. If you want a cute blog button to help remind you (and spread the word), then you are so welcome to it, and if you have been super consistent with your Club 17 stuff, you get the cute one (like I have – look to the left) with the crown. All of this will make so much more sense if you read here. I’ll be back in a few days to pick a winner – be sure to do that exam and say ya did! Later Wednesday would get even stranger. It became the Sleepless Night of Vomit. I think I’ll spare you most of the details, but I will tell you that I ended up having to scrub multiple WALLS in the house, not just floors. Ew. And the dog? The dog has whooping cough. 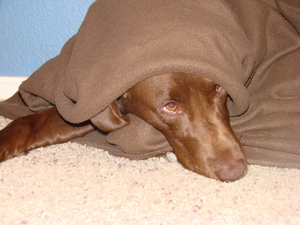 How sad is a chocolate lab, wrapped in a chocolate blankie? He had a chill, and was grateful to be tucked in. And you might not ever guess this in a million years, so I think I’ll tell you. Frequently my children do things that are SO disgusting, I can’t even clean it up enough to blog it in such a way that wouldn’t make you sick and never return. Seriously. I know I gag you out sometimes, but it could actually be so much worse, you have no idea. So I"ve been gone. I"ve been in and out of town twice since i last blogged – thanks for asking all of you. I’m fine. Today I was en route back home when Mike took Caden-3yr and Seth-almost2yr to the grocery store. So. Mike + 2 toddlers + grocery store. Don’t we already sense what’s coming? Mike said everything went fairly well until they got to the milk section. THen Caden-3yr tried to help. A gallon of organic milk busted, spilled, and spewed everywhere. Mike used the word ‘fountain’ and that’s a very bad word to have to use with milk. Mike also said Caden-3yr was soaked from the top of his head all the way down, and Mike was completely soaked from the knees down. Caden-3yr chimed in and said, "MOM. That milk." He shook his head in disbelief. "That MILK just went EVERYWHERE." Huge hand gestures to go with it. I’m so glad I was in another state at the time. New meaning to lactose intolerant, because I so woulda been.